How can we prepare for the PGTRB Exam? - is the biggest question which stands before us. It is very difficult to choose a correct material for preparing these exams. 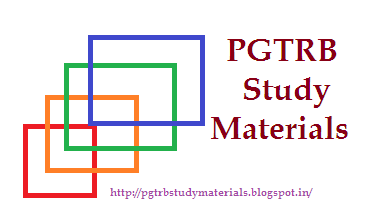 In our website we uploaded so many PGTRB study materials in various subjects. It will help the exam preparing candidates very much. These TRB PG Asst Recruitment Exam Study Materials are prepared and collected from so many efficient professors, academies... and various sources. Before we start our work for preparation first we must know the question paper pattern. Each PGTRB Question paper will be consists of 150 questions. These questions are devided as from the content of concern subject -> 110 + Psychology and Teaching aptitude -> 30 + General Knowledge and current affairs -> 10. So Total Marks = 150. The PGTRB Materials of Various Subjects are given below.